Understanding how various cell types differentiate themselves during development is one of the fundamental questions in developmental biology. Using genome-editing tools, Harvard scientists are getting closer to finding answers. A recent study authored by Alexander Schier, chair of the Department of Molecular and Cellular Biology and the Leo Erikson Life Sciences Professor of Molecular and Cellular Biology, James Gagnon, a postdoctoral fellow in Schier's lab, and Aaron McKenna and Greg Findlay, Ph.D. students in the lab of Jay Shendure at the University of Washington, developed a system that uses the CRISPR genome-editing tool to mark zebrafish cells with a genetic barcode that can later be used to reconstruct their lineage. The study was published earlier this year in Science. "We would like to understand how cells go down different avenues during development and end up as specific cell types," Schier said. "With this new tool, we can take adult brain cells and … see how those cells are related to each other all the way back to the embryo. "In this system CRISPR targets 10 short sequences and randomly cuts them, inducing either deletions or insertions as the cell repairs the cuts," he explained. 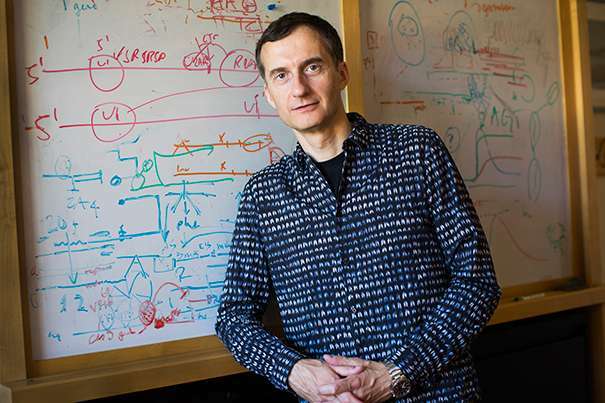 "We can then sequence those areas, and understand how the cells relate to each other." For example, Schier said, a single cell may have one sequence cut in a certain location, but as it divides, its daughter and granddaughter cells may be cut at additional locations. By tracing how those changes accumulate, researchers eventually can identify how cells relate to each other. The more closely related cells are, the more similar their mutated barcodes. Though the idea of marking cells to track their development isn't new, the new technique offers far more versatility and specificity. "One major way this has been done is by labeling cells with fluorescent proteins and then following the inheritance of the color," Schier said. "For example, one could deduce that cells that are purple might have come from a common progenitor that was purple." The problem, Schier said, was that even the most advanced systems were limited to only about 100 distinct colors. "The power of this method is that you can, essentially, get thousands of colors," Schier said. "In this paper, we demonstrated that we could produce 4,000 unique barcodes which we could trace to see how cells are related to one another." Already, Schier said, the technique is providing new insights for researchers to investigate. "There are some tantalizing hints we found," he said. "For example, we found that more than 98 percent of the blood in one fish came from just five progenitor cells, and in another fish it came from just two. This raises interesting questions of tissue dynamics that we would really like to understand—how relatively few progenitor cells give rise to a large number of blood cells or brain cells." Schier's lab isn't alone in exploring the possibilities of using CRISPR to understand how cells develop. Researchers working in the lab of George Church, the Robert Winthrop Professor of Genetics at Harvard Medical School (HMS), developed a similar system in which the guide RNA sequence that instructs CRISPR where to cut was also the target. The end result is a system that targets a specific genetic sequence and cuts it, but as that cut is repaired it creates a new guide RNA, telling the system where to cut next, and generating enough diversity to allow researchers to trace a cell's lineage. This study has been posted on the preprint server BioRxiv. The next step, Church said, will be learning not only how cells develop into adulthood, but how and when cells change their identity during development. "We want to know who begat whom," he said, but also "what the cells are thinking and what they're doing. We can stop the merry-go-round at any point in development and take a snapshot of their lineage and what the cells are doing."